Copyright Kyushu Electric Power Co., Inc.
Award winners of a private-public initiative green contest, "eco japan cup 2009," were announced on December 2, 2009. The contest was organized by Japan's Ministries of the Environment and Internal Affairs and Communications, the Environmental Business Women, the Sumitomo Mitsui Banking Corporation and the Development Bank of Japan, with the aim of finding potential green business ventures to help create a sustainable society where environmental and economic goals are successfully integrated. One of the awards in the business category was given to the Kyushu Electric Power Co., Inc. for its geothermal binary-cycle power generation system. 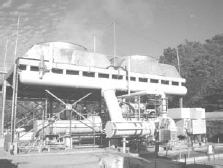 The system collects lower thermal energy by heat exchange with a low-boiling medium and utilizes the vapor medium to generate electricity. In the culture category, the grand prize went to a plantable seed paper called "Tef-Tef Garden (Butterfly Garden)" created by Hiroki Yaginuma and Kanehiro Oda. The water-soluble seed paper, illustrated with butterflies and their favorite plants, is made from recycled pulp and embedded with seeds of plants that attract butterflies. In the lifestyle category, an award was given to Ryuichi Sakamoto, who has unified his diverse activities as a musician and an ecologist. As for the policy category, which was established for the 2009 awards, an award went to g-Enesis, the energy club at the University of Tokyo, who made a policy proposal for a matchmaking project to promote the installation of solar panels in local areas. The contest was held between July 21 and August 31, 2009, and received 1,327 entries, which surpassed the previous year's total applications of 584. The award-winning works were displayed at the Eco-Products 2009 Exhibition from December 10 to December 12, 2009.